The need for a coherent region-wide strategy for the Mekong has never been greater. 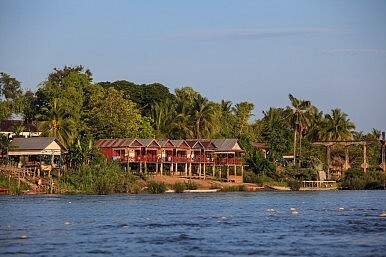 Excessive flooding and contamination of salt water from rising sea levels caused by global warming are shaping-up as the biggest threats to the Mekong River, the fish stocks of which serve as the livelihoods for the roughly 60 million people living along its banks. Those threats have propelled food security into the higher ranks of government agendas, but sharp disagreements between neighbors and an inability to enforce their own laws designed to protect the already endangered species is casting doubts over the ability to deal with catastrophic disasters. Pivotal in this is the Mekong River Commission (MRC), which is charged with managing the sustainable development of the waterway. It expects temperatures to rise by 0.8 degrees Celsius by 2030 with annual precipitation jumping by 200 mm. Over the longer term, that temperature range is anticipated to rise from between one to four degrees Celsius by 2050. The science still needs some buttressing but the threat to the Mekong Basin is as real as it is to the tiny island nations of the Pacific Ocean. Complaints from those living near the river are already a major source of newspaper headlines. Farmers are complaining about land lost to record floods, restricting crop production and their earnings. This was being further complicated by dam construction in Laos who MRC insiders blame for undermining a regionally coherent, science-based strategy for the Mekong River. As downstream countries Cambodia and Vietnam have most to lose, they are constantly being irritated by Laos bureaucrats operating within the MRC system for an apparent “agree and ignore” policy when it comes to the MRC’s three key strategies – water resource management, agriculture, and natural disaster management. “The MRC in many ways does a terrific job,” one global change scientist who declined to be named said. “But it falls short and the only way that the necessary reforms can be made is from within the bureaucracies and the governments. Aquaculture, fish farms and agriculture will be at risk from saltwater contamination as much as from drought and floods, leading to food shortages and much higher prices. This raises the possibility of major, unwanted, population shifts into urban areas and across borders. According to one senior researcher, problems associated with climate change were as simple as the disappearing mangroves along the banks of the Mekong and its many tributaries, and a common belief that even at record levels, floods would not break the river’s banks in places like Phnom Penh. Damage wreaked by such a calamity would be enormous and probably on a much greater scale than the Thai floods of 2011, which claimed 815 lives. Many drowned, particularly children because they could not swim. The resources available in Thailand simply don’t exist in Cambodia which would be incapable of dealing with any outbreak of disease that should be expected to follow. “Therein lies the heart of the issue in combatting the impact of changing weather patterns,” the researcher said. Efforts were also being hampered by corruption, a lack of transparency and the types of governments the MRC is supposed to serve: one-party communist states in Vietnam and Laos, military juntas in Thailand and Myanmar, and a feudalistic democracy of sorts in Cambodia. This is unlikely to change any time soon, hence insiders are complaining loudly but privately that the need for greater cooperation and a coherent region-wide strategy for the Mekong River’s future has never been greater.